It does look pretty but I'm not convinced. It's the pastry. Essential in a tart, of course, but increasingly I feel, an enemy of fish. 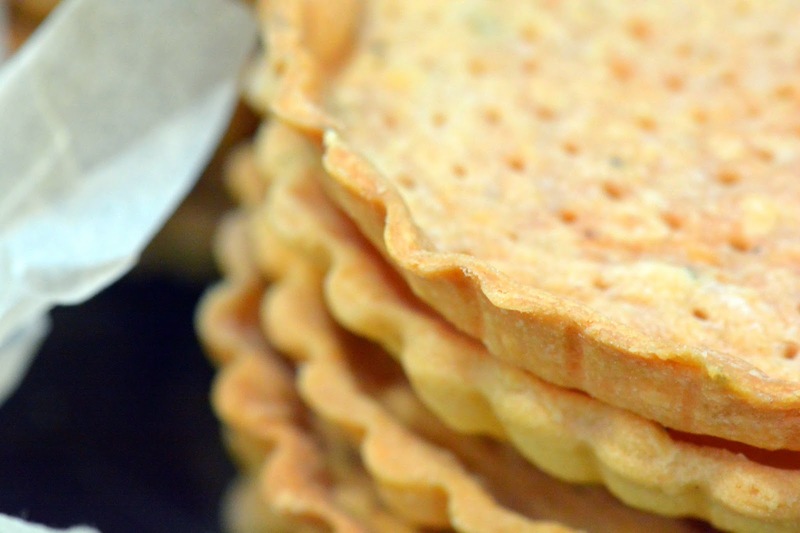 These tart cases were good and thin, made with 'pate à foncer' (the one above was actually my worst) but still I think it interferes with the fish too much. Maybe I've never been convinced by pastry and fish. Salmon en croute isn't a winner for me. Fish pasties? Perish the very thought. It's the dryness of the pastry defeating the fish. Much better to make a gratin of the mix in a ramekin, then I can leave the mix slightly wet and creamy and top it with a crust of crispy, seasoned breadcrumbs; drizzle it with this or that. Pile up the fish flesh so the top just chars in the oven. Perhaps serve this with a selection of baby veg à la Grecque, slightly pickled but very aromatic carrots, fennel and green beans. Perhaps some soft yolked quail's eggs (but, oh, the peeling!). I adore smoked haddock. Gently poached, crowned with an egg and it's one of my 'final meals'. It's right up there with pate de foie gras and truffle with brioche toast, followed closely by skinny chips and a whole plateful of dippy fried eggs. Tomato concasse (pictured above) is simply peeled, deseeded and chopped tomatoes with a zingy vinaigrette. I didn't peel though. I often don't. It looks like a lot of work only to remove flavour. Text books complain of tough, indigestible skin. Maybe toms were different back in the day but I don't find it offensive. Same with red peppers. I suspect cheffy sensibilities clicked way past the 'no one cares' point. Anyway, I added lots of chives and some chopped baby scallion/spring onion stems too. But look, here's the recipe for both the pastry and the filling. Make your choice. While I remember, I need to rant about smoked haddock. Just WHO is buying the yellow stuff? It's dye. It used to be nasty tartrazine, a coal tar derivative (now banned) but the stuff in supermarkets is probably turmeric and/or anatto, which is natural at least. But why would you choose to add chemicals? They have nothing to do with the smoking process. I don't care if it 'looks right', don't do it. Sometimes the only haddock left available is the custard coloured nonsense and then I HAVE to buy it because I LOVE smoked haddock. Enough! Let's all calm down. You can't make pastry in a rage. Pate à Foncer (flan pastry) - makes about 500g of pastry, enough for two large flans or eight tartlets. This is easy to make and very well behaved. In fact, it's offensively easy to make. You don't need pastry hands you don't need hours bashing butter. It doesn't break or crumble and accepts much abuse and rerolling. It does shrink a fair bit though. I leave my crusts overhanging and only trim to size after blind baking when the pastry is still flexible. If you cut the pastry after the second bake, you risk chunks falling away, unless you have a VERY sharp knife. This recipe is a Michel Roux Snr, as are almost all of my pastry. In a food processor, pulse up 125g unsalted butter and 250g plain flour until it looks like breadcrumbs (a matter of seconds). add a good pinch of salt, the same of castor sugar and a beaten egg and pulse again a few times until the mix starts to come together. Finally dribble in 40ml of cold water while pulsing. The mix will coalesce into large chunks. You'll hear this as well as see it. That should have taken no longer than five minutes, including time to weigh the ingredients. You can, of course, do this the old fashioned 'food ec' way in a bowl, rubbing together the butter and flour between your fingertips until it's breadcrumbed then add the egg etc and mix with a spoon. Remove the pastry and work it with the heel of you hands for a few seconds until it's smooth. Wrap in cling film and refrigerate for 20 minutes. This makes it much easier to handle and roll out. It'll keep for a few days in the fridge. After this it takes on a nasty grey pallor (I forgot some once alright!?). Roll out the pastry to 2mm thick (less than a pound coin, more like a 50p). Cut out slightly larger circles than you need to line the tin(s). Press well into the sides of the your tart tin(s) but leave an overhang. prick the base all over with a fork. This stops steam bubbles ruining your base. Line with foil or baking paper and fill with baking beans/lentils/ball bearings. Bake at 180°C. Ten minutes for individual tartlets, 20 minutes for a large tart. Remove from oven. Remove beans and lining. Trim tart to tin edge with a sharp knife. Return pastry to oven and bake for another 10 -12 minutes. the case should be pale brown (see pic). Remember it will be further baked once it's filled. This is basically adding part poached haddock to a white sauce enriched with eggs and marscapone. Take 800g of undyed smoked haddock. This is about two fillets. Place in a shallow pan and cover with 800ml of full fat milk. Bring this to the boil gently. Remove from the milk. The fillets should now be just cooked enough for you to flake. if not. Place back in the warm milk for another minute. The fish shouldn't be cooked, just yielding to the thumb. Remove all skin and bones. Check again for bones. Set aside. Strain the poaching milk and keep. In a clean pan, melt 50g of unsalted butter. When melted add 50g flour and beat, over a low heat, until smooth. This is called a roux btw. Slowly add the reserved fishy milk, beating to integrate before adding more, until you have a white sauce. Sieve if you have lumps that defeat destruction but you really shouldn't have, unless you added the flour too quickly. Simmer for a few minutes to cook out the raw flour flavour. The sauce should now be quite thick. Now add two tablespoons of marscapone, three teaspoons of English mustard and 200g of tangy, mature cheddar cheese. Season with salt and black pepper. Allow to cool for fifteen minutes.The cooled sauce may taste quite high with mustard but that pitch will be baked off. Don't worry. Trust me. Don't go all Dijon on me. Now gently stir in four egg yolks (that's why we cooled the sauce -otherwise you'd now have white sauce and scrambled eggs). Finally, stir in the haddock, keeping it chunked up. You can now either fill your tart cases or simply use ramekins and top with seasoned breadcrumbs. In either case, bake for 15-18 minutes at 180°C for a soft filling, as I like, or 20 minutes if you want a firm tart.